Because of its unique geography and strategic location between Lakes Erie and Ontario, fighting proved particularly desperate and brutal in the Niagara region. The Niagara Peninsula forms a sort of bridge across the lakes and into the vulnerable heartland of New York or Upper Canada, and both sides understood only too well that whoever controlled it would likely win the war in the West. Consequently, the Niagara border was strongly defended by a string of forts and military posts. On the British side, Fort Erie guarded the river entrance at the northeastern end of Lake Erie while a couple of days’ march to the north Fort George kept watch over the mouth of the river near the southwestern end of Lake Ontario. On the American bank of the river, across from Fort George, U.S. troops garrisoned Fort Niagara, the oldest and sturdiest of the Niagara fortifications. The fighting in the Niagara region was to prove so hot and vigorous that at one time or another all three of these forts would fall to assault or invasion. 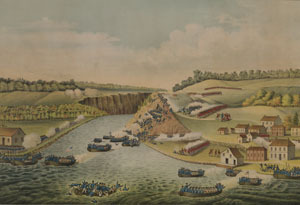 Following their capture of Fort George during the late spring of 1813, American forces made several sorties into the interior of the western Niagara region. All failed to produce positive results, but none ended more disastrously than the one that concluded with the Battle of Beaver Dams on June 24. Having been warned of their approach by the heroic Laura Secord, Lieutenant James Fitzgibbon surrounded the Americans with a handful of British regulars and a large party of Iroquois warriors. 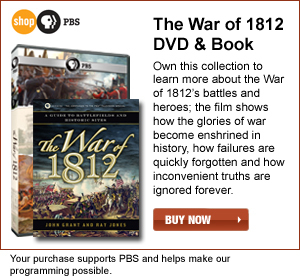 The U.S. detachment was forced to surrender, and this essentially ended the 1813 American invasion efforts west of the Niagara. A simple stone monument commemorates the British and Native American victory. However, the cairn-style monument does not mark the actual site of the battle, most of which was destroyed during construction of the Welland Canal. Instead, it is located in Therold’s Battle of Beaver Dams Park off Sullivan Street. During the summer of 1814, American troops under General Jacob Brown attempted to invade Canada via the Niagara Peninsula and on July 5 found their path blocked by British forces led by General Phineas Riall. In the battle that followed along the banks of Chippawa Creek, the discipline of the American troops surprised the British who were outmaneuvered and driven back toward Fort George. 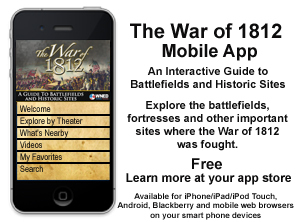 Located off the Niagara Parkway a few miles north of Fort Erie, the Chippawa Battlefield is a must-see destination for anyone interested in the War of 1812 or in early-nineteenth-century military tactics. Unlike so many other historic sites, this one remains in near pristine condition. It appears little changed from that day two centuries ago when destiny brought the determined armies of Brown and Riall together in these fields. There are no gift shops here or guides in antique military attire and not much to see except for a modest memorial obelisk and the battlefield itself, but therein lies the magic of the place. Without all the well-meaning interpretive clutter, it is possible to gaze out over the woods and meadows and imagine the smoke and din of battle. A self-guided walking tour with simple but informative descriptive markers provides a good sense of the give and take of the action. Just north of the battlefield, a plaque in King’s Bridge Park marks the site of Fort Chippawa. General Riall and his troops briefly took refuge here after losing the Battle of Chippawa. The park is located only five minutes from Niagara Falls, and the thunder of that mighty cataract is plainly audible. 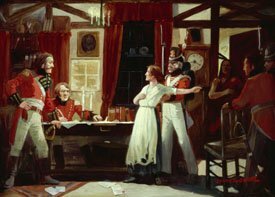 Laura Secord’s perilous journey to warn British troops of American plans for a surprise attack ended at the home of Captain John Decou, where a British detachment was headquartered. The house burned down in 1950, and a plaque describing that famous event stands beside the ruins. The remains of the house are located on Decew Road, west of Merrittville Parkway, in Decew Falls, south of St. Catharines.